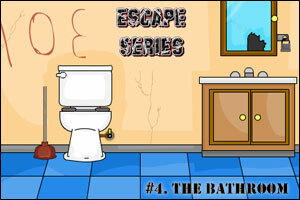 Escape Series#4: The Bathroom is the fourth installment in the Room Escape game series created by Shawn Tanner aka Afro Ninja. If you enjoyed Escape#1: The Car, Escape#2: The Closet and Escape#3: Escape the Phone Booth, you will probably enjoy this one as well! Escape Series #4: The Bathroom video walkthrough! (thanks Reka!). Another one (thanks streetracur12!). Then, I used the head on the open top of the toilet, so water wouldn’t go away. I found a wrench under the arrow, which i used to turn the water on for the toilet. I flushed it, resulting in getting the key for the mirror. How do you turn on the hairdryer ? funny, it seems my screen is stuck whenever i flush the toilet..
its under the tile by the lazor – door. And my baking soda won’t go to the wash basin. Do we need to close the sink? yes, you should close it first. still stuck at flushing. does it have buggy? cos mine is always showing the cursor in sand glass mode. How to use code ..
but i can figure it out anyway (thanks for the hints guys). What was the piece of mirror for? I’m out, but never used it. For anyone wondering why the last item used was that, yes it really happens if you drop in in there. Anyways, out. This was a nice one, though. 1. Open the cabinet below the sink and get the baking soda and baking soda label. 2. Back out and get the plunger. 3. Click the toilet and use the plunger on it. 5. Now you have the two pieces, click the top of the toilet. 6. Use the rubber top and replace the flush valve. 7. Click on the mirror and use the wooden stick and click on the mirror. You will get a mirror shard and you’ll us that later. 8. Turn to the right. 9. Notice the pattern of the tiles. See something out of place? One of the tiles is blue instead of light blue. Click on it. You’ll get a wrench. 10. Go back to the toilet. Click the valve near the bottom of the toilet. Use the wrench on it. 11. Click the top of the toilet again. 12. The tank should be full with water now. Now flush it to get the key. 13. The key is inside the toilet bowl. Get it. 14. Use the key on the lock. Open the medicine cabinent and get everything out of it except the floss, you won’t need it. You can still get it if you want. 15. Open the pill bottle. 16. Take out the note and read it. Confusing but once you solve it it’s easier to understand. 17. Go to the wall with the energy cell. Click the gray matter. 18. Use the razor and click the gray stuff. 19. Now use the mirror shard and click next to the code. The mirror will reflect the code on the other wall. The riddle make sense now? 20. Now in order to enter the code, you have to power the keypad. BUT, you have to clean the terminals. 21. Go to the sink. 22. Plug the sink and turn on the warm water. Put in the baking soda and dip the toothbrush in it. 23. Use the toothbrush to clean the terminals. 24. Now to dry the terminals, look up. Use the wooden stick and click the panel several times. You will get a blow dryer. Use it on the terminals. 25. Click the wires and it will connect. 26. Go to the keypad and enter the code on the wall with the mirror shard. 27. Use the wrench on the valve inside. 28. Almost done! Go to the bathtub and turn on the water. 29. Use the blow dryer and click the water. 30. BAM! The blow dryer will explode and turn all of the power of, including the lasers. 31. CLICK THE EXIT AND YOU”RE FREEEEEEE!!!!! to figure out the code. I don’t think I ever used the floss, though. i didnt use the floss either. i think it was pointless. Examine the room and collect what you can. First view – toilet & sink. – Toilet: get one item, note the there’s another item tantalizingly out of reach. Also note that there are two things you will have to fix (get a stopper for the tank, and turn on the water). – Under sink: get two items and examine them. – Look up: hmm, wonder if there’s something in your inventory with which you can extend your reach… Ah, got it! Turn right – view of laser-guarded door. Turn right – view of battery and some crud on the wall. – There’s nothing to pick up here, but examine everything you can. Seems you will need to do some cleaning. – Again, nothing to pick up, but you should be getting an idea of what you need to do. fix the toilet so you can get the key so you can open the medicine cabinet so you can see if there’s anything there with which to clean the battery so you can get power to the keypad so you can get water to the tub so you can… well, you’ll figure it out when you get there. the plunger’s head would make a good stopper. It’s a pretty old plunger; if you use it for its intended purpose, it might just conveniently come apart. pick up everything you see and examine them. Hmm, some sort of hint about the mirror. So maybe you need a mirror, or a piece of same? This one is already a bit cracked, do you have something in your inventory to help it along? Something metal? clean the battery, so do so now. Don’t forget to dry the terminals before you connect the wires. scrape that stuff off the wall. Remember that hint about the mirror? Didn’t it say something about being on a wall? Why don’t you try putting your mirror piece next to the code fragment you just found. Ta-da, the code! So go use the code already! It should be pretty obvious what to do when you get the panel open. put water in the bathtub. Hmm, water in the bathtub. What possible use could that be? I mean, we’re trying to disable the laser beams guarding the door so they don’t zap us… zap… electricity… water + electricity = big zap… do you see where I’m going with this? the outlet on the wall doesn’t appear to be up to code: there’s no ground fault interrupt in evidence. 11. Click on the sink, turn on hot water, click the lever behind the faucet, water fills the sink. 13. Look on the ceiling, there’s a loose tile. Use the plunger handle to move the tile – you get a hair dryer. 14. Go back to the battery cell. Use the toothbrush with soda to clean terminals, then use hair dryer to dry the terminals. 15. Connect the wires – you powered up the keypad. 18. Drop the hair dryer in the bathtub. You case the power to go out and the door is no longer armed – YOU’RE OUT!!! wrench or wood stick to crack the mirror. anything you can do with the wooden stick you can also do with the plunger before you break it. how to plug the sink?? darn, stuck with flushing…it doesn’t end…..what to do? passed it in 2 min 14 sec!!!!!!!!!!!!!!!!! how do i close the plug in the sink? Where is the blow dryer? Posted on Friday, May 29th, 2009. Follow any responses through the RSS 2.0 feed.